Vertical fastening of the frame racks. 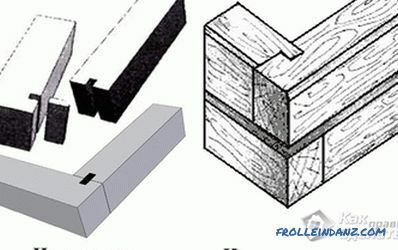 Fastening of a bar by cutting. Before starting work with a bar, care must be taken to prepare all materials and the territory where the construction will take place. Prepare the necessary fasteners in advance; 4> before purchasing a timber, be sure to accurately calculate the required size of the skinning frame, if this is not done, then with increasing thickness (unplanned) you will need to add small parts to the frame, which is not a good start scrap when building a frame framework. 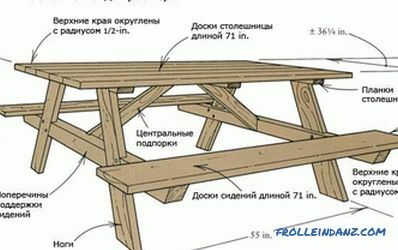 The lower binding of a bar is made according to the principle of laying on the grillage (roofing material is pre-laid). Before tying, it is necessary to cover the foundation with roofing felt (suitable for cheap) or film, otherwise the timber is damaged (when the construction is frozen for several months). If there is no roofing felt, you can cover the foundation with an ordinary film, which protect the concrete from moisture and the formation of concrete jelly. When the foundation is ready for laying timber, check the level of the grillage with a level to make sure that it is perfectly even. On this surface impose a bar, necessary for the lower strapping, with the bars joining the method of sampling at the corners. The selection can be in half-tree or into paw. The half-wood variant implies an even cut into half the thickness of the timber (for joining with another timber). 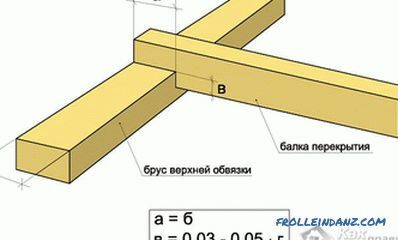 The option of attaching to the paw implies a cut at an angle of 45% from the middle of the beam to the lower end (or upper, depends on where one of the bars will be attached). fastening with the help of wooden dowel. 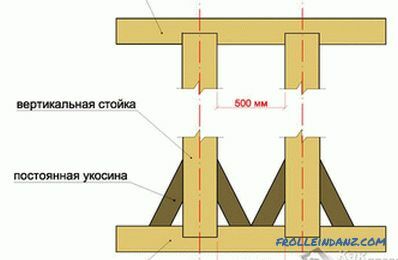 The nage must be made of dried oak, with a projection above the surface of the timber is 6-8 cm, the diameter of the dowel is always equal to the diameter of the mounting hole. Before fixing the bars compare: they must be equal diagonally and at the corners. 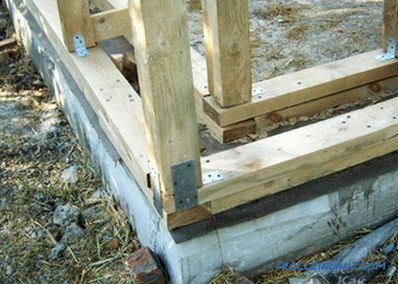 In the lower strapping, the timber is fastened to the foundation with the help of nuts with wide washers. 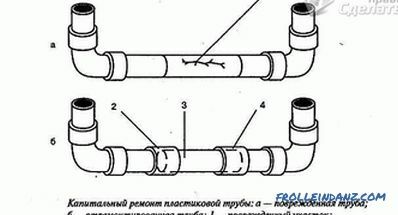 The washer improves fastening with the foundation, because it increases the plane of adhesion of the two surfaces. The nut is selected on a turnkey basis - hex, other options are not suitable. 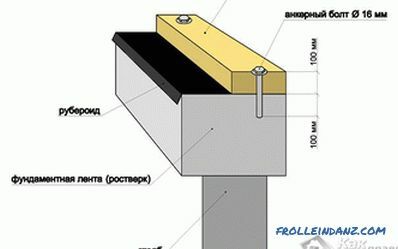 When the bottom trim bars are connected with nails or pins, the corner anchor is not required. 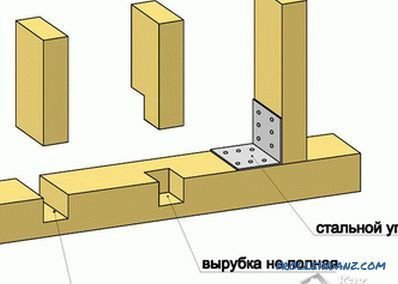 If the corners were fixed differently, without lugs or nails, then the first anchor is attached to the corner in the place where the bars join. The vertical posts of the frame structure are installed after the process of lowering the bars has been completed. When working on installing racks, start with corner frames. 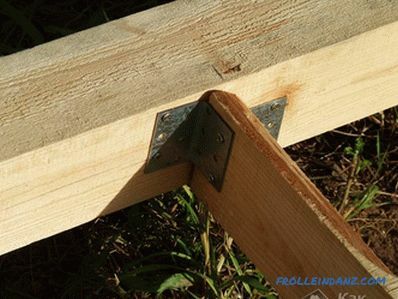 If the bottom piping is on nails or anchors, the corner post is fastened with a steel corner. After attaching the bottom trim, they put the corner posts on the left overhangs of the issues 6-8 cm. Fixing of non-corner posts is done in two ways: by cutting, with steel corners. Corners hold the construction more reliably, they have only one drawback - cost. The corners themselves are attached to the timber with self-tapping screws. 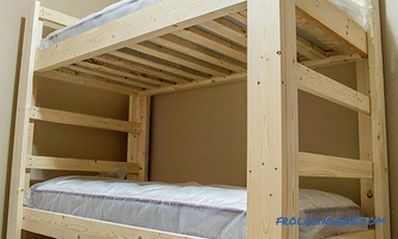 The punching method involves fastening with a special recess having a depth of 50% of the thickness of the bottom trim. Example: if a timber has a thickness of 80 mm, then the cutting depth will be 40 mm. Non-corner stands must be fastened with the stitches that hold the construction and Do not let her loose. Ukosiny needed until such time as it is not done the upper trim construction bars, then ukosiny can be removed. 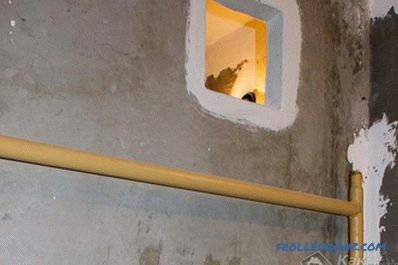 It is more convenient to join the rails of the top trim at the cutting area or using corners from galvanized steel.If the method of cutting is chosen, then it is necessary to make accurate markings for cutting for each vertically installed bar (stand). The grooves of the upper trim must coincide with the grooves of the lower trim, otherwise you will get a skewed design, which gradually collapses itself.